There’s nothing like a good booth. Booths are underused in English restaurants. To me, they herald a cozy night out and a great place to nap when you’re too full. I used to do just that as a kid when the grown-ups were still chatting away over their grown-up sized portions and I love booths still. So, when I was seated in a comfy, raised booth at the new curry restaurant Carom – located on Wardour Street in Soho – I was immediately lulled into a sense of early satisfaction. “Mmm…cozy booth,” I mumbled, as the waiter and the boy looked at my purring stature oddly. 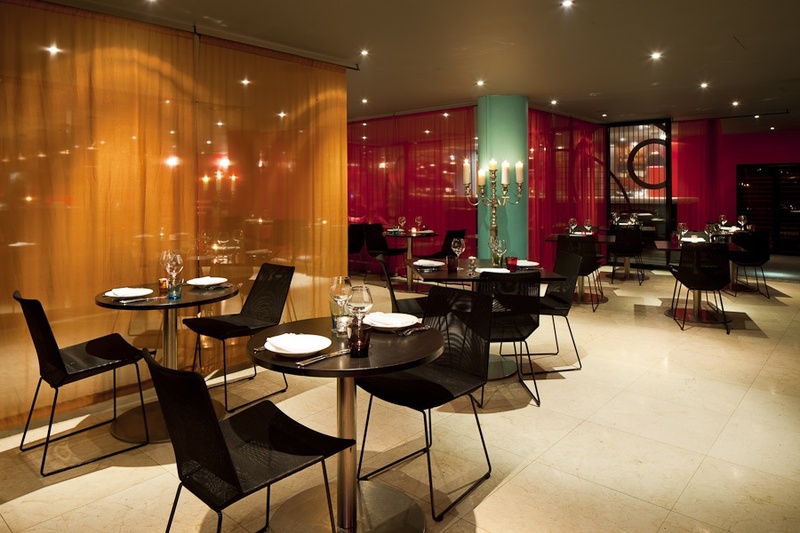 Carom opened in November and is a part of the D&D London group: think Coq D’Argent and Quaglino’s. Heading up the management is effortlessly friendly Pradeep, formerly of the Ramsey restaurant world, while the kitchen is manned by ex-Benares executive chef Balaji Balachander. It has taken over the space above Floridita, where Meza used to reside. The long, circular bar still occupies the room’s middle portion, but the walls and pillars have been decorated Desi style – it’s a bit of Bollywood come to London, all neon turquoise, pink and gold paint, muted by dark wood and dim lighting. Vintage posters line the walls and there’s even an imposing stuffed tiger lounging in the central restaurant area which, when I was overly full post-dinner, I almost wanted to curl up with. But back to the booth and the boy. As we settled in for a bit of mid-week comfort food, our eyes were drawn to the cocktail menu. This was my second time at Carom so I knew what to expect, but the boy was suitably intrigued by the list, featuring cocktails made with Indian spices like curry leaf, cardamom, saffron and coriander. He went for the Bangalore Cooler (made with Indian Amrut whisky, coriander, cardamom, pear purée and maple syrup) while I chose the supremely odd Monsoon Season (saffron gin with Sauv Blanc, elderflower, rhubarb and curry spice). It’s not every day you see curry in a cocktail, after all. As I took my first sip, I couldn’t help but expect the worst. To my genuine surprise, it worked. There was no doubting the curry flavour, or the white wine and gin mix. But it was weirdly delicious. The dryness of the curry blended with the same dry base of the wine and gin in an enticing manner. After this good start – comfy booths AND curiously quirky cocktails – our expectations were raised for the meal. Carom works on a “tapas” style – breaking its menu into component parts of “Favourites”, “Tandoor” and “Curry” plus sides and breads. Waiters recommend a person chooses a dish from each section in order to have a healthy bit of sharing. Since my previous visit, chef Balachander had changed up the menu, saying his original one had been lacking on spice so he decided to notch things up a bit after receiving customer feedback that it wasn’t hot enough. It makes sense – after a couple of powerful cocktails from the bar your taste buds are suitably numbed to take on a punchier hit. And, it was the only thing I noted as a downside in my notes from my original visit – the food wasn’t hot enough. So, it was with a welcome note that I saw a revamped menu featuring some spicier bites. We weren’t disappointed – we let Balachander send out a selection and it was rewarding. Juicy, meaty chicken wings were served with a buttery curried yoghurt dip; vegetable “Pothi” parcels were zinged up with a seriously tasty tamarind and mint sauce; while the salmon, well the salmon was a dream: crunchy skin, fall apart soft meat, surrounded by a mint, coriander and lime leaf sauce that made it pop. The only thing I found a bit lacking was the potato and corn cake – it felt a slightly bland compared to the incredible spices of the other dishes. Carom is big on featuring not only Indian inspired cocktails but stocking drinks from the country as well – the Amrut whisky is an example, but I was intrigued to see Indian wine on the list – something I’d not had before. To accompany our mains we opted for the Grover Vineyards 2009 Cabernet Shiraz. It was like a normal, rich cab shiraz, but with an added level of cigar-tinted smokiness, which worked beautifully with the tandoor and spicy elements of the dishes. Mains consisted of perfectly cooked tandoor chicken – the star of which was the accompanying mint chutney; along with a lamb biryani topped with puff pastry. Green beans were served with water chestnuts, peanuts and coconut – a simple but delicious twist to a potentially bland side, while sea bass came floating in a coconut, ginger and mango sauce. It was very tasty but felt a bit out of place, almost like it belonged more on a Thai menu. But, like a meal at my grandmother’s house – where no one leaves hungry, or, even happily satiated – we were cajoled into trying a couple of desserts too. A mango and cardamom creme brulee was gooey and sporting a sugared top that crunched like frozen snow; the pistachio kulfi was traditional and tasty. By the time all of the dishes were finally done, I was in a sleepy haze, the tiger’s cushy comfort luring me to bed down for the night there and then. Seeing my nodding head, the boy smartly helped me out of my booth – despite my complaints of “Nooo…I don’t want to go out into the cold!” – and got me out before this happened. 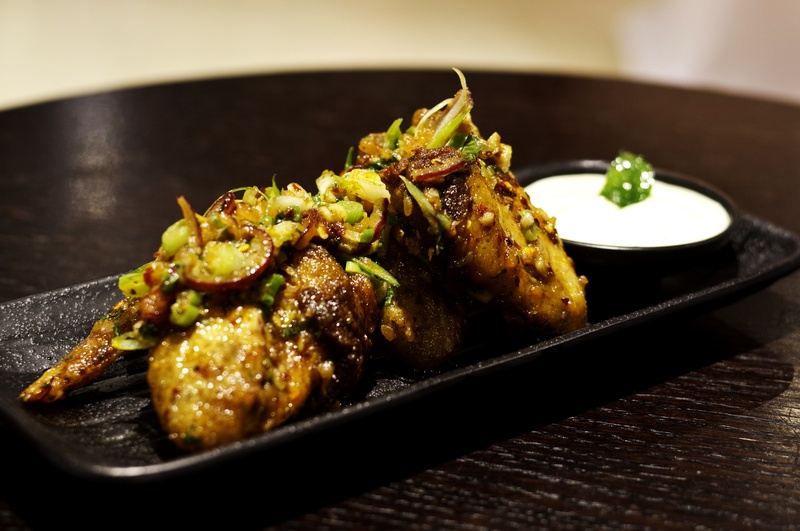 Carom is a welcome addition to the already restaurant-heavy Soho. By refreshing the menu based on customer feedback, it feels like Balachander has his head firmly in the court of revamping through awareness. And it works. The restaurant – with its management pedigree – could have chosen to become the next “posh” curry house; but instead, it balances a hip Soho media feel with quality dishes at very reasonable prices.